From the designer: When I started laying out this course I promised myself I would make the layout fair to righties and lefties alike (or backhand and forehand - whichever) and I think Hole #4 is evidence of that. The giant pepper tree that dominates the view from the tee is a formidable obstacle for RHBH hyzer shots, yet they still try. Hit the tree and you are rolling the dice to see whether you have any look at the basket at all. 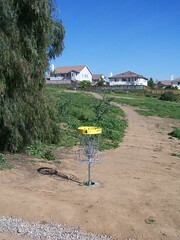 Me, I like to throw a big, sweeping anhyzer out to the left of the tree and watch it coast in towards the basket. I'm also pleased to see a lot of typically RHBH throwers try out their sidearms - it pays to be versatile. The B tee just makes the angle around the tree a little tighter and usually throws dead into the wind. Some time in the Spring of '09 we'll be adding a mandatory pole that will make the big RHBH hyzer shots illegal, since they require you to throw directly over the tee for Hole #5.